Even at companies that thrive on innovation, board meetings tend to be low-tech affairs. Typically, directors are handed a thick stack of papers before the meeting to help them prepare. It can be a cumbersome task, one in which it’s hard to stay organized. The Swiss firm Sherpany is transforming board meetings through Boardroom, its subscription-based software that’s designed to help members make more effective decisions, and without all the stress associated with a paper system. All the documents they need are easily accessible on their mobile device, whether it’s running iOS or Windows 10. Users can also sign in on other devices via the web using a recent browser. The tool comes packed with user-friendly features, like a personalized dashboard that allows the user to keep tabs on multiple committee matters at once. It also comes with a question-and-answer function that provides rapid feedback from members of the management team. Board members can annotate documents or access the history of a topic with a swipe of their hand, a clear benefit to busy corporate executives. At a time when risk management is a top priority at many organizations, Sherpany believes having that information at one’s fingertips can be an invaluable asset. “We reduce waste by cutting administrative, organizational and repetitive work and spare resources like paper, shipping and transportation,” says Sherpany CEO Tobias Häckermann. Sherpany got its start in 2012 by launching the first software platform in which investors could cast their votes electronically. Soon after, it unveiled Boardroom, a product it saw as a game-changer in the way board meetings get done. The market has clearly bought into the idea. Just five years ago, the company had a total of 10 corporate clients. Today, roughly 210 companies are using its technology, and its users include some of the biggest corporations in Europe. 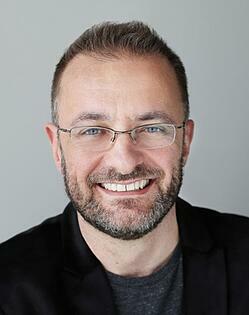 Sherpany’s customer base and physical presence continue to grow. In addition to its Zurich headquarters, the company now has satellite offices in Paris, Milan, Lisbon and Wroclaw, Poland. That success, the company says, is in no small part to the programmers, designers and engineers who make up much of its small staff. In total, the company has around 50 employees who have made Sherpany the fastest-growing startup in Switzerland. Even the company’s name, a nod to the Sherpas who guide climbers up some of the most treacherous slopes on earth, suggests its emphasis on innovation. The company’s goal, according to its website, is to grasp for new frontiers and help those intrepid customers who have come along for the journey. 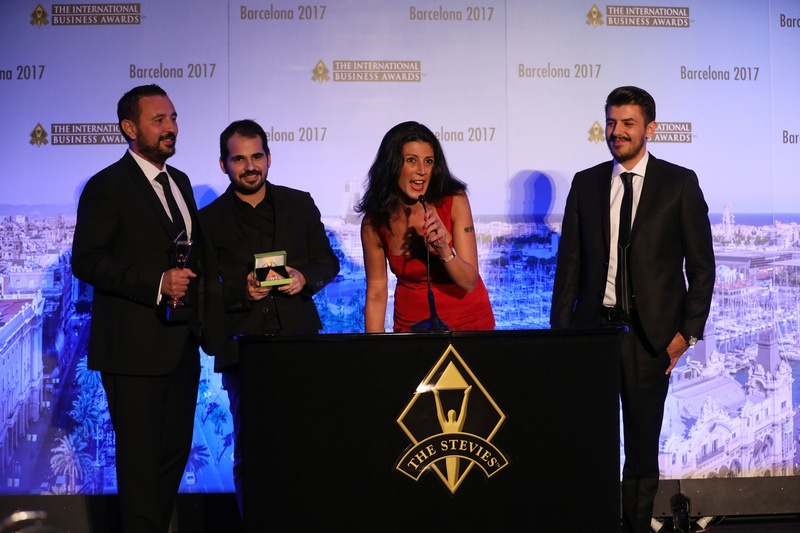 Sherpany’s latest version of the app, Boardroom 3, recently earned the Silver Stevie® Award in the “Mobile Site and App” categories at The 2017 International Business Awards, which received entries from more than 60 countries around the world. The Stevie® Awards, organizer of The American Business Awards, announced today that the final entry deadline for the 15th annual ABA competition has been extended to April 7. No additional late fees will be charged. Entries submitted through April 7 will not be penalized in any way in the judging process. “We’ve received so many requests for individual deadline extensions that we’ve decided to extend the deadline for everyone,” said Stevie Awards president Michael Gallagher. The original final deadline was March 15. The American Business Awards are widely considered to be the premier business awards program in the U.S.A. All organizations operating in the U.S.A. are eligible to submit nominations -- public and private, for-profit and non-profit, large and small. The 2017 awards will honor achievements since the beginning of 2016. 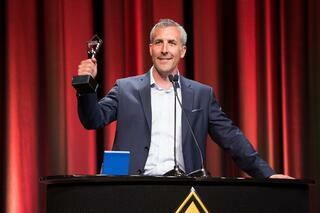 Entry details are available at http://www.StevieAwards.com/ABA. Close to 150 executives worldwide will determine the Gold, Silver and Bronze Stevie Award winners. The judging process has begun. Gold, Silver and Bronze Stevie winners will be announced on May 1, and the awards presented at a gala banquet on June 20 at the Marriott Marquis Hotel in New York City. Attendance is not required to win. The list of past Stevie Award winners in The American Business Awards reads like a who’s who of innovation and business success in the U.S.A. Explore the lists of past Stevie winners here. 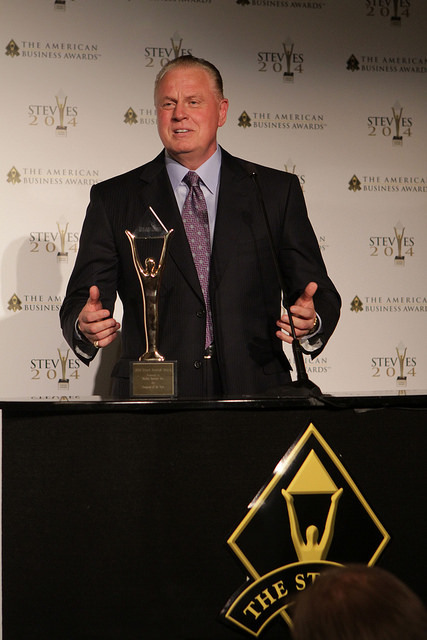 The Stevie Awards are conferred in seven programs: The American Business Awards, the German Stevie Awards, The International Business Awards, the Stevie Awards for Women in Business, the Stevie Awards for Sales & Customer Service, the Asia-Pacific Stevie Awards and the Stevie Awards for Great Employers. Honoring organizations of all types and sizes and the people behind them, the Stevies recognize outstanding performances in the workplace worldwide. Learn more about the Stevie Awards at http://www.StevieAwards.com, and follow the Stevie Awards on Twitter @TheStevieAwards. The Stevie® Awards, organizers of the world’s premier business awards programs, today announced the Gold, Silver and Bronze Stevie winners in The 14th Annual American Business AwardsSM. All organizations operating in the U.S.A. – large and small, public and private, for-profit and non-profit - are eligible to submit nominations to the ABAs in a wide range of categories, honoring achievement in every aspect of work life, from customer service and management to public relations and product development. More than 3,400 nominations were reviewed in the judging process this year by more than 250 professionals, whose average scores determined the winners. 2016 Stevie winners will be celebrated and presented their awards during a gala event on Monday, June 20 at the Marriott Marquis Hotel in New York. Tickets are now on sale. The presentations will be broadcast live via Livestream. CallidusCloud (Dublin, CA) is the leader among Stevie Award winners, with 40 wins in a wide range of categories, including six Gold. CallidusCloud is sure to be among the winners of the Grand Stevie Award trophies, the top overall winners in this year’s ABAs, who will be announced next week. Winners of four Gold Stevies include CAS (Columbus, OH), Jeunesse Global (Orlando, FL), and MWW (East Rutherford, NJ). This is the first year in which Stevie winners in The American Business Awards are announced before the awards gala. In the ABAs’ first 13 years, finalists were announced in advance of the awards gala, but the Stevie winners weren’t revealed until the night of the presentations. Every new product or service nominated in The 2016 American Business Awards will automatically be included in voting for the People's Choice Stevie Awards for Favorite New Products, a worldwide public vote. Voting will open tomorrow and conclude on June 3. People’s Choice Stevie winners will be announced the week of June 6, and will be honored during the June 20 presentations. San Jose: Cisco Systems, Electric Cloud, EMC, Malwarebytes, PayPal, RiseSmart, TextRecruit, TiVo Inc., and Zoom Video Communications, Inc. The 12th Annual American Business AwardsSM announced Stevie® Award winners on Friday at its event focused on outstanding new products and services and on achievements in technology industries. Friday’s gala was the second of two American Business Awards ceremonies this year. The first took place in Chicago on June 13 and honored winners in disciplines such as customer service, human resources, corporate communications, live events, publications, and selected categories for company/organization, management and marketing. Winners in all new product awards and technology-related categories were announced at the event in San Francisco on Friday. More than 260 executives attended Friday’s awards banquet at San Francisco’s Palace Hotel. Stevie Awards were conferred in four levels of distinction: Grand, Gold, Silver and Bronze. The Grand Stevies were awarded to the organizations who received the most awards overall – Gold, Silver or Bronze – in the ABAs this year. Quality Systems of Irvine, CA was presented with the Grand Stevie for Organization of the Year. The winners of the other Grand Stevie Awards will be named in a followup press release today. AT&T, Inc. was the top Gold Stevie winner on Friday, with four. Winners of two Gold Stevies include Accenture, Agiliance, Akavit, Engility, Haneke Design, MarketLive, MicroStrategy, Spingo, VeriFone, Vimeo, and WillowTree Apps. 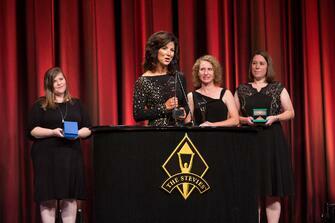 For a complete list of The 2014 American Business Awards winners announced Friday visit www.StevieAwards.com/ABA. Winners of the People’s Choice Stevie Awards for Favorite New Products, which were determined by more than 57,000 votes in July and August, were announced in August and presented their crystal People’s Choice Stevie Awards on Friday. More than 3,300 entries were submitted to The 2014 American Business Awards and more than 240 executives nationwide participated in judging to determine this year’s Gold, Silver and Bronze Stevie Award winners. Entries for The 2015 American Business Awards will be accepted starting in October. The 2015 (2nd annual) Asia-Pacific Stevie Awards, the premier business awards competition for the region will offer fully revamped and expanded entry categories. Nominations will be accepted starting the week of September 15. Get the entry kit as soon as it's available. All individuals and organizations in the 22 nations of the Asia-Pacific region -- public and private, for-profit and non-profit, large and small -- may submit nominations to the Asia-Pacific Stevie Awards. 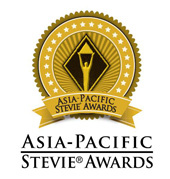 See the full list of Asia-Pacific Stevie Awards categories. Nominations should cite achievements since July 1 2013. There is no eligibility timeframe for app and web site entries - it does not matter when they were first published. The early-bird entry deadline, with discounted entry fees, is October 29. The entry deadline is December 3, but late entries will be accepted through January 28 with payment of a late fee. Entry details are available at www.asia.stevieawards.com. Gold, Silver and Bronze Stevie Award winners will be announced on March 11. The 2015 winners will be celebrated at the second annual awards banquet on April 24, in China. Contact us with your questions about how to participate in the 2015 Asia-Pacific Stevie Awards. The Stevie® Awards have announced the winners of the Best of the IBA Awards in The 2014 (11th Annual) International Business Awards, the world's premier business awards competition. Nominees in the 2014 IBAs were not able to apply for the Best of the IBA Awards directly. Winners were determined by a points system based on the total number of awards won in the IBAs. This year's Gold, Silver and Bronze Stevie Award winners in The International Business Awards were announced on August 13. The winners of the Best of the IBA Awards will be presented with Grand Stevie Award trophies at The 11th Annual International Business Awards banquet at The Westin Vendôme Hotel in Paris, France on October 10. Organization of the Year: Quality, Systems, Inc. Irvine, California, USA. With 68.5 total points, Quality Systems, Inc. is the most honored organization in the 2014 IBAs. Public Relations Agency of the Year: MWW. MWW offices around the world won a total of 42.5 points. Marketing Agency of the Year: Weber Shandwick. Weber Shandwick offices worldwide won a total of 39.5 points.